I'd like to take one more try at discussing yesterday's blog post and the idea of revelations from God. Sadly, I don't think the Church teaches the difference between the Logos Word and the Rhema Word. Both refer to the Word of God, but with different implications. Logos is the revelation that the "Word of God" is Jesus Christ, who is the subject from Genesis to Revelation. When John 1:1 says, In the beginning was the Word, and the Word was with God, and the Word was God, we recognize that, here, the Word is specifically Jesus. And the term "Word" is Logos in the Greek. But Rhema is the revealed word of God, as an utterance from God to the heart of the receiver via the Holy Spirit, as in John 14:26: But when the Father sends the Spirit of Holiness, the One like me who sets you free, He will teach you all things in My name. And He will inspire you to remember every word that I’ve told you. In this case, the term "word" is Rhema in the Greek. To summarize, Logos is a theological term with a clear reference to Jesus as the Word in the Bible. 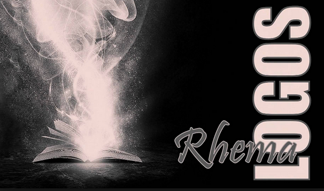 Rhema is a spiritual encounter with the Word, whereby the principles of the Bible are communicated directly to the heart and spirit of the Believer. The problem is that much of the Church doesn't recognize the Rhema Word or hunger for it. And of course, the Rhema Word must coincide with what is revealed about the Logos in the Bible. I do not believe God or Jesus will speak a word to our hearts or spirits that contradicts His Word in the Bible, but I certainly believe They have a desire to illuminate the Word to those who will receive it. I invite you to consider the following passage in the Bible. I think it expresses much better than I can, what I am talking about ... For we did not receive the spirit of this world system but the Spirit of God, so that we might come to understand and experience all that grace has lavished upon us. And we articulate these realities with the words imparted to us by the Spirit and not with the words taught by human wisdom. We join together Spirit-revealed truths with Spirit-revealed words. Someone living on an entirely human level rejects the revelations of God’s Spirit, for they make no sense to him. He can’t understand the revelations of the Spirit because they are only discovered by the illumination of the Spirit. Those who live in the Spirit are able to carefully evaluate all things, and they are subject to the scrutiny of no one but God (1 Corinthians 2:12-15, The Passion Translation). To us in the 21st Century, this should tell us that there is a valid connection between revelation from God (Spirit-revealed truths) and the Bible (Spirit-revealed words). They are meant to work together to bring us into greater intimacy with the Father and to guide us to fulfill our purpose for the Kingdom Jesus came to establish. And I absolutely love what Paul tells us in this Second Chapter of 1 Corinthians. He is not shy about proclaiming his reliance on spiritual power that comes from God's Holy Spirit. He makes it clear that the message he preached was not an attempt to sway them with persuasive arguments [to believe his particular brand of theology], but to prove to them the power of the Holy Spirit in him. We should all meditate on this statement in verse 5: For God intended that our faith not be established on man’s wisdom but by trusting in His almighty power. That means that the basis of our faith should not rest on the persuasive words of humans, but on what He reveals through His Spirit... what Paul calls "wisdom from God", or what I refer to as God's "revelation". To bolster this idea of God's revelation Paul says, However, there is a wisdom that we continually speak of when we are among the spiritually mature. First of all, it should be clear to us that there is a growth process to our faith, and a wisdom that only comes from growing spiritually -- not just from reading the Word or understanding its context and history; but a wisdom that comes from joining together "Spirit-revealed truths with Spirit-revealed words", as he expressed in verse 13 above. But how many Christians even acknowledge that God's truth can be Spirit-revealed? If they only rely on their own [or their favorite pastor's] interpretations of the Word from their human wisdom, aren't they denying the Spirit of God the opportunity to reveal the mysteries of God? Isn't this what Paul is implying when he says in verse 7, "Instead, we continually speak of this wonderful wisdom that comes from God, hidden before now in a mystery"? Before Jesus sent the Holy Spirit to live inside each of us, we were not privy to the revealed wisdom of God. We could understand a certain level according to the capacity of our human mind, but God is bigger than that! I'm going to say it one more time ... we can now receive "Spirit-revealed truths" because we have the Holy Spirit in us and a greater capacity for communion with our God. I know that I will probably be unable to persuade anyone to see the reality of greater revelation from the Spirit. That has to come from trusting that God wants to reveal more of Himself through His Spirit. And as my husband is fond of quoting, "A man convinced against his will, is of the same opinion still". And I don't really want to convince anyone based on my own human argument. I want them to experience an encounter with the almighty power of God's Holy Spirit and receive the revelations of God because they are illuminated by the Spirit, Himself! Just as Paul says, if we don't live in the Spirit, then we live on the human level, and none of this will make sense. I praise God that my spirit has been able to evaluate His truth and I am subject to the scrutiny of no one but my God! 1 Corinthians 2:9 Things never discovered or heard of before, things beyond our ability to imagine—these are the many things God has in store for all His lovers.